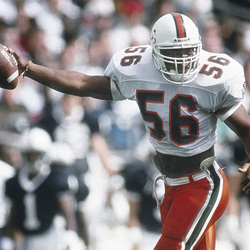 Linebacker Micheal Barrow earned two rings as a member of the 1989 and 1991 National Champion Hurricanes. An incredible senior season was Barrow's response to the disaster which had befallen his hometown of Homestead, Florida just prior to the start of the '92 campaign: Hurricane Andrew. Miami's Hurricanes dedicated their season to alleviating the sorrow felt by the community, and this extra motivation propelled Barrow to become the very visible team leader to South Florida and the nation. In his senior season, Micheal Barrow shined the brightest. After wins against Florida State and Arizona, Barrow turned it up against the Nittany Lions at Happy Valley. He had 19 tackles with three for losses, including the potential game saver on fourth-and-one at the Miami five. After his stellar final campaign which saw him lead the team in tackles (136-80 solo), Barrow was selected as an All-American, the Big East Defensive Player of the Year and finished seventh in the Heisman balloting. He also won the University of Miami's 1992 Jack Harding MVP award. Barrow finished his UM career (1989-1992) with 401 total tackles and assists, keeping him in the top-5 in the Miami record books. A second-round draft pick of the Oilers in 1993, Barrow spent three seasons in Houston, followed by two with the Carolina Panthers and four seasons with the New York Giants. He is now a member of the Washington Redskins. Barrow's resume of community involvement is longer than his football resume. A tireless and selfless volunteer, Barrow has donated time and money to feeding the homeless, church activities, children's clubs and inner city sports leagues. Barrow graduated from the University of Miami with a Bachelor's degree in Accounting and Business Administration.